First … Chameleon is known for our Brazilian Blow Out Treatments. We perform hundreds of them each year. We know the all the details to create the absolute best customized treatments for our clients. Your Chameleon Stylist will assess your hair and determine which result you would like to achieve – smooth or keep curl/wave. 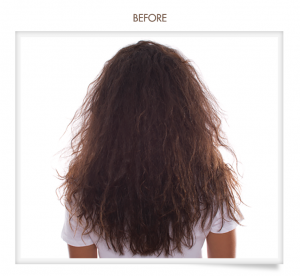 Brazilian Blow Outs are completely customizable. 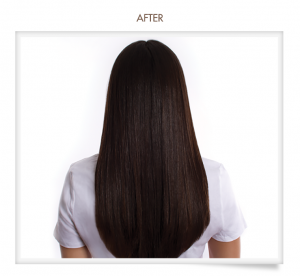 You can decide how smooth or wavy you want your hair to be. We will cleanse your hair with our specially formulated Ionic Cleanser to prepare your hair for optimal smoothing results. After towel drying, your Chameleon stylist will divide your hair into sections and begin to apply the Brazilian Blowout Professional Smoothing Solution through each section of the hair from root to tip; lightly dusting each section, careful to not saturate it. We will then blow-dry your hair as smooth and straight as possible using a round, boar bristle brush. Your Chameleon stylist will now apply the Brazilian Blowout Smoothing Serum to assist in detangling hair prior to final blow dry and styling. After about 90 minutes (depending on the density and amount of your hair), your treatment is completed, and you can leave the salon with the freedom to immediately wash your hair, exercise, or put it up in a pony tail or clip without having to wait to do so. Then enjoy your smooth, frizz-free, shiny locks for up to 12 weeks. To enjoy the look and feel of week one results up to week ten, make sure to use Ionic Bonding Spray as well as Açai Anti-Frizz Shampoo and Conditioner to preserve your treatment.